PT Jasa Peralatan Pelabuhan Indonesia - PT JPPI or referred to as "IPC Port Equipment" is a reputable company in Indonesia with core business in port equipment maintenance and engineering services. Its business include port equipment maintenance and repair services, port equipment consultant services and consultant for crane investment. IPC Port Equipment also provides equipment components and spare parts in the work environment of IPC Group. PT Jasa Peralatan Pelabuhan Indonesia is a directly-owned subsidiary company of state-owned port operator PT Pelabuhan Indonesia II (Persero) or Indonesia Port Corporation (IPC Group). 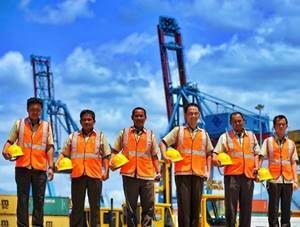 Currently, the majority of IPC Port Equipment’s shares are owned by IPC Grup (99%) and the remaining is held by PT Multi Terminal Indonesia (1%). IPC Port Equipment is based in Jakarta and its head office is registered at Sentra Bisnis Artha Gading Blok A-6A No 2, Jl Boulevard Artha Gading, Kelapa Gading Jakarta Utara. IPC Port Equipment now has operated in 10 ports spread over Java, Sumatra and Kalimantan. IPC Port Equipment also provides maintenance services for loading and unloading equipment to several IPC Group's subsidiaries. According to PT Pelabuhan Indonesia II (Persero) Annual Report 2016 as cited by JobsCDC.com, IPC Port Equipment's total revenue in 2016 was down 16% at Rp 80.01 billion from Rp 94.93 billion in 2015. In year 2016, IPC Port Equipment recorded total net loss of Rp17.97 billion as compared with total net profit in 2015 amounted to Rp8.15 billion. Mastering the operational Oracle ERP. Strong desire to study and work hard. Mastering and have a good skills in PHP and MySQL programming. Technical knowledge on installation, maintenance, and troubleshooting of operating system / program / hardware. Have a good understanding about the information network as per TCP / IP concept. Mastering and have a good skills in Mikrotik configuration. Have a good understanding about the administration on finance. Have a good understanding about the flow of accounting and accounts receivable. Minimum GPA of 2.75 (PTN) or 3.00 (PTS) within 4.00 scales. D3 / S1 Computer Engineering, Information Technology, Informatics Engineering, Information Systems. D3 / S1 Finance, Financial Management, Accounting. JobsCDC.com now available on android device. Download now on Google Play here. Please be aware of recruitment fraud. The entire stage of this selection process is free of charge. PT Jasa Peralatan Pelabuhan Indonesia - D3, S1 Fresh Graduate, Experienced Staff IPC Group October 2017 will never ask for fees or upfront payments for any purposes during the recruitment process such as transportation and accommodation.